One of the recent notable aspects about the Xeon E3 family was the lack of a significant presence with Intel’s Broadwell architecture. A handful of them were released under the E3 v4 nomenclature, with half of them only for embedded solutions – we reviewed the socketed models at the time, but noted through IDF that the main direction these models were going seemed to be towards Intel’s Valley Vista PCIe co-processors, where three of them would be fixed to a PCIe card. For most single socket workstation users, this means a jump from Haswell-based E3 v3 to Skylake-based E3 v5. In a somewhat muted launch today, without any PR announcement or anything in the way of details direct, Intel quietly launched details regarding their new workstation single-processor platform based on Skylake. Through Intel’s processor information repository, Intel ARK, eleven socketed models were released in the E3-1200 v5 Xeon family. As with previous Xeons, the goal here is to supply server level features that wouldn’t normally be on consumer grade hardware. All these parts support DDR4 un-buffered modules in both non-ECC and ECC configurations up to 16 GB per module, giving 64 GB maximum. Xeon platforms historically run at base JEDEC memory configurations, so expect to see DDR4-2133 at 15-15-15 subtimings being the norm. Similar to the Skylake consumer parts, DDR3L up to 1600 MT/s is also supported. These are all quad core parts, ranging from 25W low power models at 2.1 GHz base clock (with hyperthreading) up to up to 80W for the fastest 3.7 GHz model. Prices will range from $193 for the E3-1220 v5 up to $612 for the E3-1280 v5. 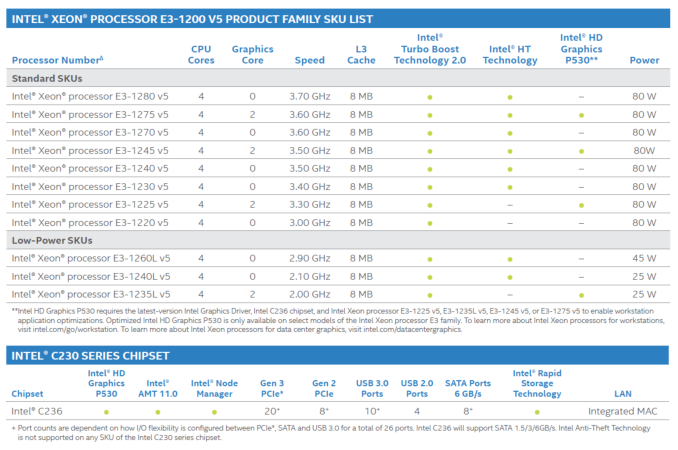 As shown in the table, only a select few will have integrated graphics, and those that do will be under the HD P530 designation, which if we refer to the standard Skylake launch corresponds to a GT2 configuration with 24 execution units. At this point in time, there are no dual core parts. Several parts clearly fly out as interesting – the E3-1275 v5 comes in at just over half the price of the E3-1280 v5 for only a 100 MHz deficit on the base clock. For $9 less, the E3-1270 v5 does the same as the E3-1275 v5 but without the integrated graphics. The one below that, the E3-1260L v5, is one of the low power parts at 45W but still comes close in single threaded frequency to those above it. 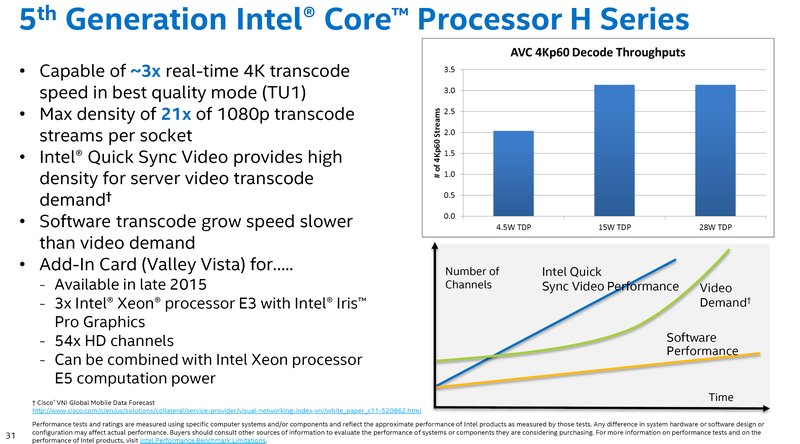 One of Intel’s big comparison points to these parts will be with Xeon D-1540, also known as Broadwell-DE. This is a 45W part that offers eight cores at 2.0 GHz base/2.6 GHz turbo, with similar DDR4 support but 12MB of L3 cache ‘at $581’. Users interested in the perennial alternative to the Core processors, the E3-123x range, might come up empty handed this generation. Not necessarily due to the processor itself, but multiple sources in discussion or published at ComputerBase are concluding that Intel is further locking the Xeon processors down for Skylake. This means that in order to use a Xeon processor, you need a server based chipset, such as the C230 series, rather than the 100-series found in consumer platforms. Several companies have confirmed that a ‘workaround’ in this case is most likely not possible. This new segregation tactic shows that Intel is perhaps trying to adjust any overlap these two markets may have had for non-business users, putting more power into the hands of the OEMs that develop pre-build systems. While E3-1200 based server motherboards have not been difficult to source in the past, they tend to be workstation/server focused and not have bells and whistles that accompany consumer boards. This also removes any thought of potential overclocking that may/may not be overlooked in some Xeon parts in the past. That being said, we have seen ASUS/ASRock release workstation type motherboards in the past that still have consumer trimmings. 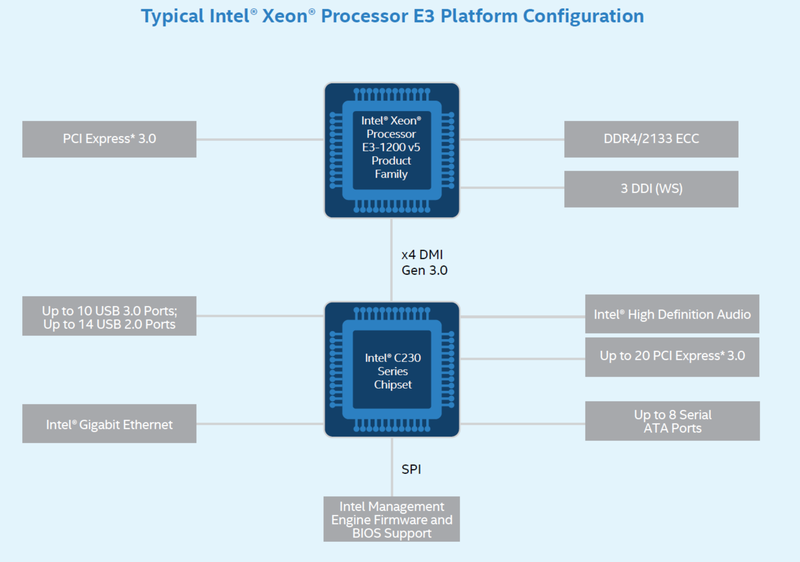 Addition 10/21: The quote direct from Intel is that 'we do not validate or support Xeon E3 SKUs with client chipsets'. This has always been the case in the past so nothing on the official line has changed, and at this time Intel is not making any additional comment to the adjustment in compatibility. The new Greenlow platform (E3-1200 v5 Xeon plus C236 motherboards) will look like the consumer counterparts with sixteen PCIe lanes for co-processors, dual DDR4/DDR3L memory support, DMI Gen 3.0 to the PCH, a mix of PCIe 3.0 lanes from the chipset, support for up to eight SATA 3.0 ports, and a myriad of possibilities through 26 lanes of HSIO. At this point in time the launch seems to be biased towards workstations rather than anything 1P server related, but information is currently patchy. At this point in time we are looking to get sampled with some of these processors, along with appropriate motherboards as well. Some motherboard announcements have been made from GIGABYTE Server and ASRock Rack, and I suspect workstation OEMs will come forth in due course. Now that I think about this .. it makes total sense. On the Z series chipsets, you get overclocking, and since the BCLK is divorced from the other busses now, you can overclock freely ANY/ALL Skylake cpus ... if you are using Z series chipset. No, it's not. It could be, hardware wise. But Intel artificially couples the BCLK again to the other busses on non-K models. This is not well known, because almost noone tests the non-K models. Last week I've seen the first review (!) of one, I think at computerbase.de.